Along with hundreds of other churches and Cathedrals throughout the country, the bells of St Etheldreda will be rung at 19.05 to commemorate the 100th anniversary of the end of WW1 and pay tribute to the millions of soldiers who died or were wounded. This entry was posted in Activities and tagged bells, peace, St Etheldreda, WW1 on November 10, 2018 by thehorleyviews. 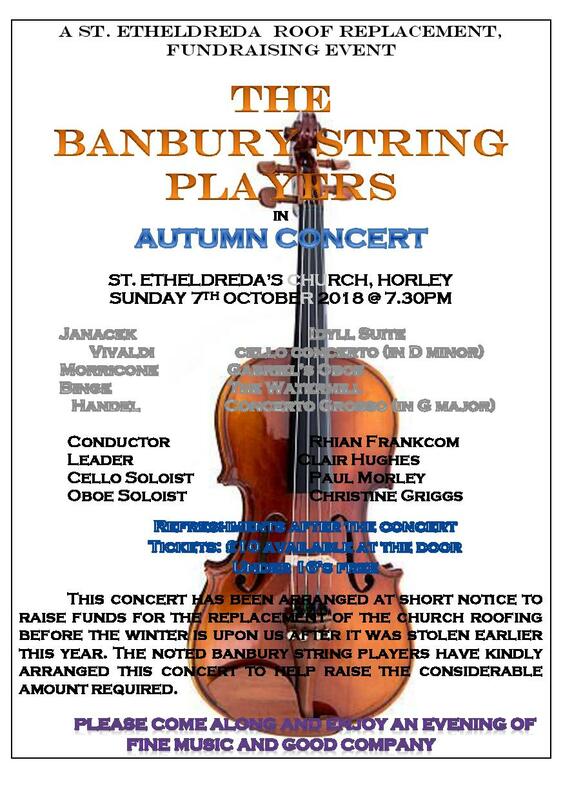 Banbury String Players are performing in an Autumn Concert at St Etheldreda’s Church at 7.30 on Sunday 7th October. The proceeds from ticket sales are very generously being given to the church as a contribution to the cost of replacing the tower and north aisle roof coverings following the lead thefts a couple of months ago. Do please come to enjoy the concert and to support the care of St Etheldreda’s. Admission is £10 and under 16s are free. See below for more details. 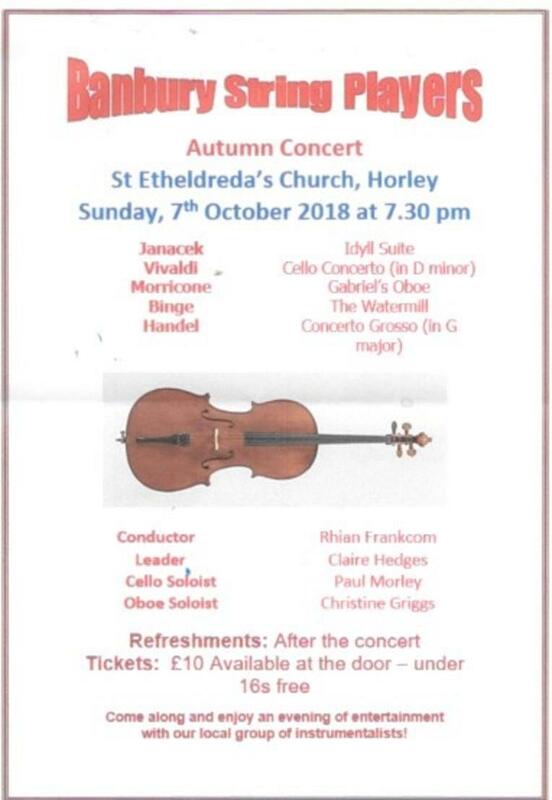 This entry was posted in Villagers and tagged Autumn Concert, Banbury String Players, St Etheldreda on October 3, 2018 by thehorleyviews. Banbury String Players are performing in an Autumn Concert at St Etheldreda’s Church at 7.30 on Sunday 7th October. See below for more details. This entry was posted in Villagers and tagged Autumn Concert, Banbury String Players, St Etheldreda on September 23, 2018 by thehorleyviews. Oxfordshire Historic Churches Trust is proud to be part of the national Ride+Stride Day on Saturday 8 September 2018. Over the last 54 years, Oxfordshire Historic Churches Trust has given in grants, several million pounds to churches and chapels of all Christian denominations in Oxfordshire to help maintain them and save roofs, stained glass, wall paintings and much more. Recently we have been supporting the installation of roof alarms for churches who have had, or are vulnerable to, lead thefts and of recent years given substantial grants towards making the buildings more useful to the local community – for example by the installation of kitchens, loos, extra rooms and more. Please call into St Etheldreda’s for refreshments any time between 10 and 4. For more information and online registration click here. This entry was posted in Uncategorised and tagged Ride and Stride, St Etheldreda on September 6, 2018 by thehorleyviews. Tessa and Chris Howell invite you to this year’s Ironstone Festival on Friday and Saturday September 7th and 8th at St. Etheldreda’s church Horley. There will be several pieces which involve 6 to 8 instruments (sextets and octets) including the wonderful Octet by Mendelssohn. There is a festival pass if you come to everything with £5 off all tickets for Horley residents, and thanks to the generous Michael Hardinge Trust, Horley Children in full-time education can come free. On Sunday 9th there will be a Festival Mass at which the Right Reverend Colin Fletcher, Bishop of Dorchester will preach and celebrate the Eucharist. All are welcome. 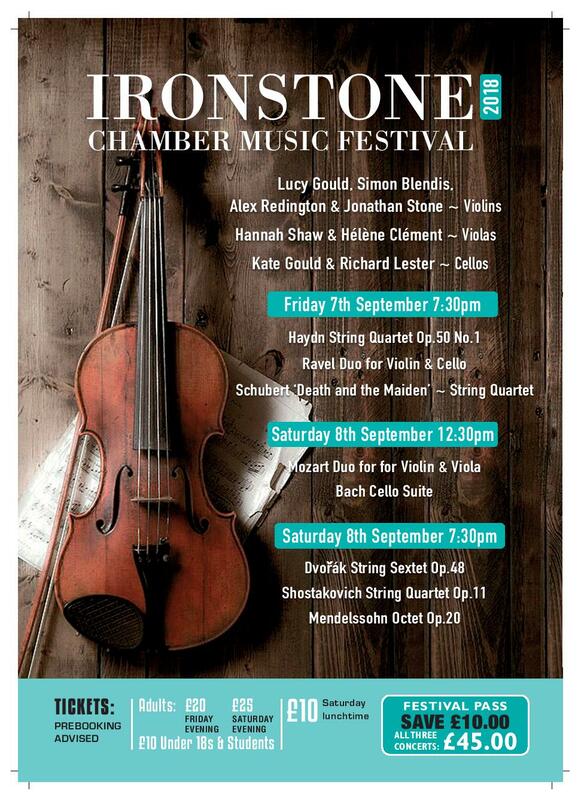 This entry was posted in Villagers and tagged Ironstone Chamber Music Festival, Michael Hardinge Trust, St Etheldreda on September 3, 2018 by thehorleyviews. This entry was posted in Villagers and tagged Ironstone Chamber Music Festival, Michael Hardinge Trust, St Etheldreda on August 14, 2018 by thehorleyviews. 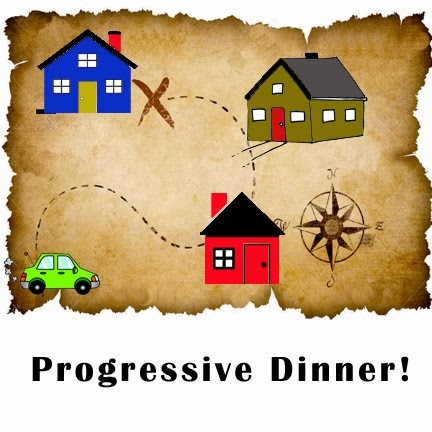 The annual Progressive Dinner took place last Saturday evening and was as ever an enjoyable and successful event. This year 82 villagers took part with 10 brave couples hosting! Many thanks to the organisers and everyone involved for making it such a fantastic evening. £1240 was raised for St Etheldreda’s church. This entry was posted in Villagers and tagged Progressive Dinner, St Etheldreda on June 19, 2018 by thehorleyviews.